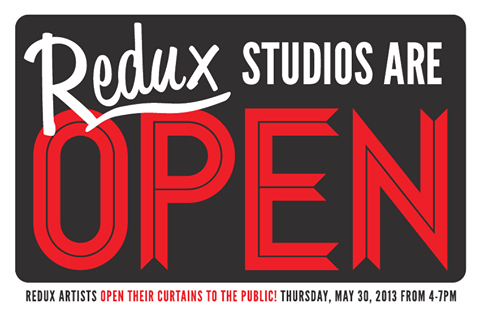 OPEN STUDIOS TONIGHT! Come discover all that Redux has to offer with a tour of our facilities, a chance to view our new exhibition by Andrea Stanislav:Nothing is True, Everything is Permitted, and be amazed by our revamped (traditional) dark room! Visitors will also have the rare opportunity to meet our studio artists and see what they’re working on. Light refreshments will be served. This entry was posted in Events and tagged Andrea Stanislav, new dark room at redux, Redux open studios, redux studio artists. Bookmark the permalink.